Yoke type track rollers are single or double row units mounted on shafts or studs. They comprise thick-walled outer rings with a profiled outside surface and needle roller and cage assemblies or full complement needle roller or cylindrical roller sets. 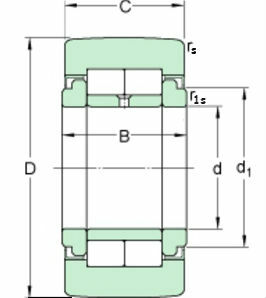 Yoke type track rollers can support high radial loads as well as axial loads arising from slight misalignment and skewed running; they are suitable for applications such as cam gears, bed ways and conveying equipment. The bearings are available with and without an inner ring and in both sealed and open versions.